Recorded on the last day of the New York Comic Con, this episode has four other bloggers and Evan talking about our experience at the con, our favorite announcements and events, and our opinions on the state of the anime and manga industries. This was literally a blogger roundtable, as we were bloggers sitting around a round table in the press room. The guests include the folks from Anime Almanac, MangaBlog, and Reverse Thieves. You might notice that Evan forgets to introduce himself at the beginning. For those who are new to the podcast and can't figure it out on their own, he's the EIC of the blog and the host of the podcast. [0:00:21] Getting right into the action, we are recording a live show at the New York Comic Con! Introductions ensue: Scott, Alain, and Kate and special non-credentialed guest Greg. [0:01:24] "What are your opinions on the con?" 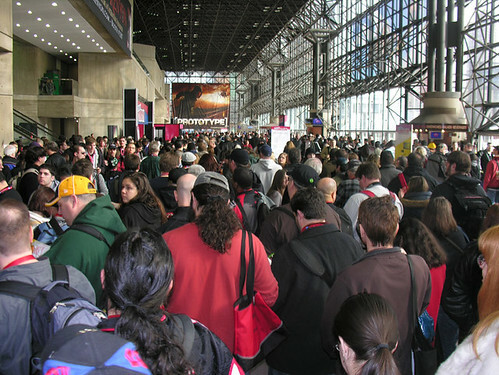 It was packed, particularly on Sunday due to Joss Whedon's presence. Alain talks about people cutting their fingers off in order to see Whedon. This did not actually occur, though it certainly would have been entertaining if it had. [0:02:07] Brigid Alverson (from MangaBlog.net) joins in on the fun, bringing her ungodly amount of manga expertise to the podcast. [0:06:41] We were going to talk about everyone's favorite announcement, but Scott is intent on industry discussion, so we get into that. He talks about the ICv2 Conference, which I unfortunately didn't attend. Brigid brings up the awesome new licenses for the Viz Signature and VizKids lines. Yen Press's Yostuba&! license comes next, and we all fall head over heels in love with Yen. (Hey Scott, if you love them so much, why don't you MARRY THEM?) Brigid loves CMX too. Also, Viz just licensed Rumiko Takahashi's new manga, so we talk about that, and Alain predicts the plot synopsis. [0:21:01] We get to a little bit of general comics discussion as we consider the possibilities of comics being published first as webcomics and later as trade paperbacks. According to Art Spiegelman, people will never give up that experience of reading a comic on the printed page. [0:32:33] Brigid gets to talk about her panel, "NewsFlash! Teen Girls Read Manga." Evan brings up the really interesting idea of flipping manga aimed at mainstream readers. There will be an article about this on Ani-Gamers in the future. Soon we get to talking about literature being adapted into manga. Then we complain about Del Rey's new OEL manga featuring (as Kate called him) "Bishie Wolverine." Evan makes Kate angry by mentioning a potential Twilight manga. [0:44:43] "Final thoughts?" It's awesome. Crazy and hectic, but so worth it. That's a wrap! [0:45:17] Outro: Brigid's in the Twilight Zone!